Convenient under sink installation providing "Bottle Water Quality"
copper, sodium, bacteria, viruses, and much more can be eliminated using only water pressure. and other particles down to 5 micron. 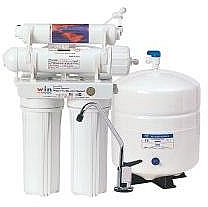 Double carbon block filters to absorb heavy chlorine and chlorine byproducts such as chloramine, THM, and TCE. The double carbon briquettes filter out organic matter from water without release of carbon fines. The carbon block prepares water to enter the reverse osmosis element. of impurities including Total Dissolved Solids (TDS), bacteria, and viruses down to 0.0001 micron. The product water is stored in the storage tank, while the reject water is automatically flushed down the drain. GAC filter is used to remove dissolved gases, bad taste and odor from product water. This is the polishing stage before consumption.